Everyone knows it takes great dedication and organization to run a successful household. 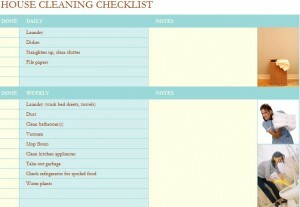 To help keep you organized with your house cleaning, you can download this easy to use Printable House Cleaning Checklist right from this page, to use as your guide to organization in your cleaning routine. This printable checklist will have your chores within your view when you use this free downloadable checklist to keep track of your daily, weekly, monthly, and seasonal cleaning chores. This Printable House Cleaning Checklist has areas for you to keep track of your daily, weekly, monthly, and seasonal cleaning chores. Each pre-listed task has its own area for you to check off when each of the listed duties is complete. There are extra spots in each of the categories for you to fill in your own tasks that are not on the list of the work page. There is a column on the right side of the page that you can utilize for any notes that you may have to make for yourself for future reference. Download the selected checklist from right here on this page to your computer. Add any extra duties to the list that you normally perform but are not on the list of the form. Save a copy of this completed form to your computer and print out a copy for your immediate use in keeping your cleaning on track. Save a blank copy of the form to your computer for future use. Envision your day’s activities to be sure that all of your tasks are on your list. Keep this list in a place where you will easily see it each day, as a reminder of what is yet to do, and tasks that are complete can be marked off. To finish all of the items on ones daily, weekly, monthly, or seasonal cleaning checklist, it is a great idea to use this completely free and downloadable Printable House Cleaning Checklist to keep your cleaning list in order.